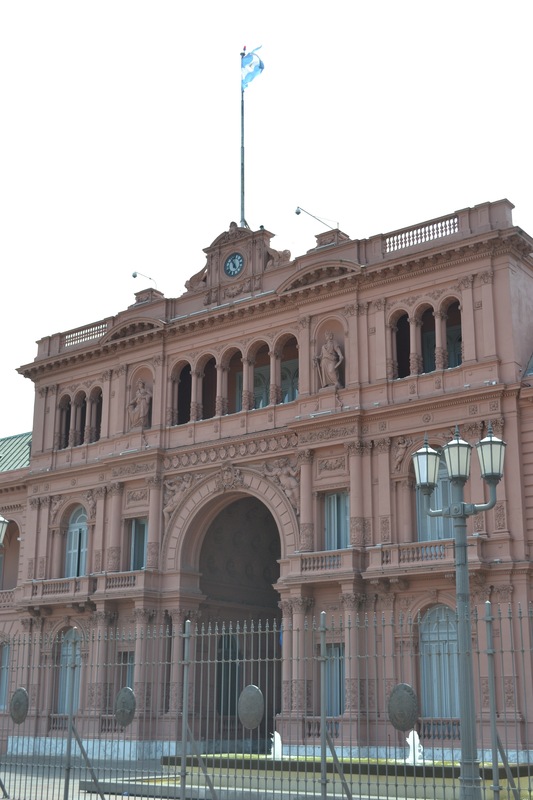 With the museum we wanted to start with today not opening until noon, we decided to return to Casa Rosada and take a tour. We were awfully glad we did, it was one of the highlights of the trip. 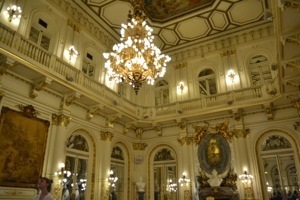 We got to see many ornate rooms and the president’s office. It was well worth an hour for the free tour. 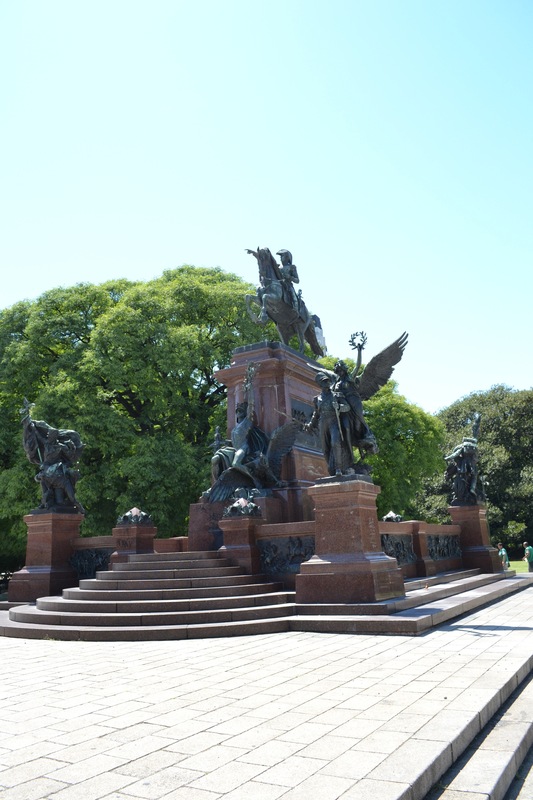 Next up was a subway ride and a walk to the Museo de Arte Latinamerico de Buenos Aires. 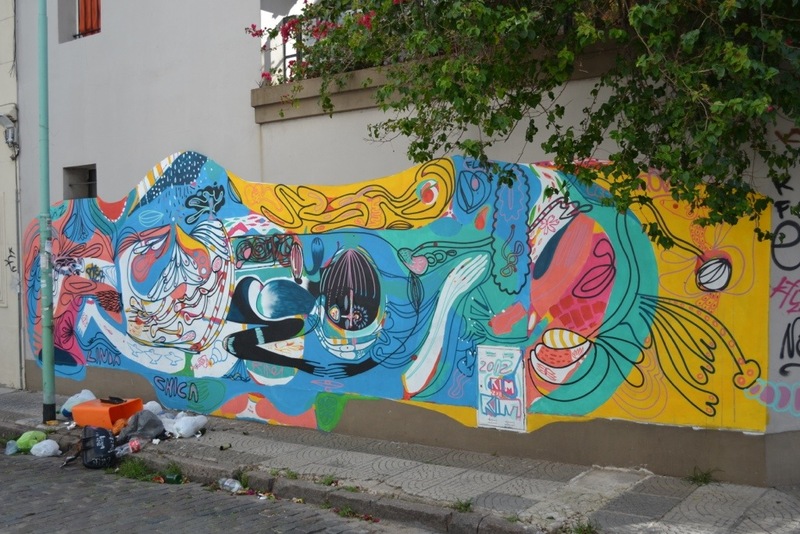 Also known as MALBA, it houses some of the best works of Latin America artists. 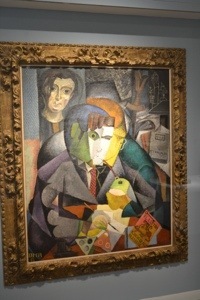 Most of the art was modern. I really enjoyed the vitality in the art, it was alive. 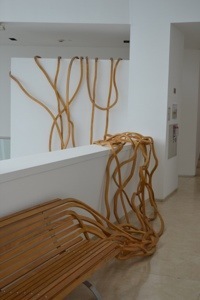 I loved this bench, which went from a serviceable place to sit to something resembling spaghetti on the wall. Also featured was the work of Diego Rivera. 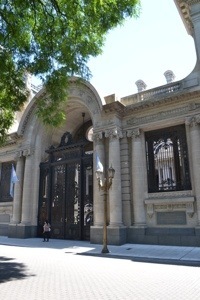 Another walk led us to the Museo Nacional de Bella’s Artes. Admission was free, and it included impressionist works. We stopped for our daily Freddo ice cream. I don’t know what we will do without their chocolate con almonds ice cream. Back to the hotel for a short rest, then out for our last dinner. We chose steak for some reason, and walked 1/2 an hour to Don Julio, where we had the hotel make a reservation. We had empanadas, tenderloin steak, potato straws ( they resembled waffle chips, just much better), Malbec, and fruit and chocolate mousse for dessert. It was a great meal and a fitting end to the trip. Tomorrow we will try to fit in a few more things. It is supposed to be 93 degrees, so we will have to take it slow and easy. There will be another entry or two. I hope you’ve enjoyed traveling along with us. As a marketer, I live for feedback, so leave a comment on the blog or a comment on Facebook or Twitter to let me know what you liked. The tango show was a lot of fun. While waiting in the hotel lobby to be picked up, we met another couple from our hotel who were also going. Jeff and Lauren were from Dallas, so the conversation quickly went to Redskins/Cowboys and RGIII. A 2nd couple joined us, Michelangelo, a performer from Venezuela and David, a designer. They both live in Miami. We talked about what we had seen or should see in BA, where else we have traveled and what we like to see. On the drive, we picked up another couple. They were Swedes who now live in Oslo. So there was plenty to talk about. We got to the theater and were seated with the 2 other couples from our hotel. We talked and talked, and drank a little wine. The show, Esquina Carlos Gardel, featured dancing and singing. There were around 5-6 couples, there were group dances, solo dances and singing. The Spanish was lost on us, but it was an enjoyable performance. Afterwards our performer friend, Michelangelo, told us we should next time see “Señor Tango,” a better tango performance. We had nothing to compare it to. We had more conversation in the van ride home, getting back around 12:30. We were told we had to see a tango show while we were in BA, and I’m glad we did. This vacation has allowed us to operate at a more leisurely pace than others. It is nice not to have to hurry to cram everything in. 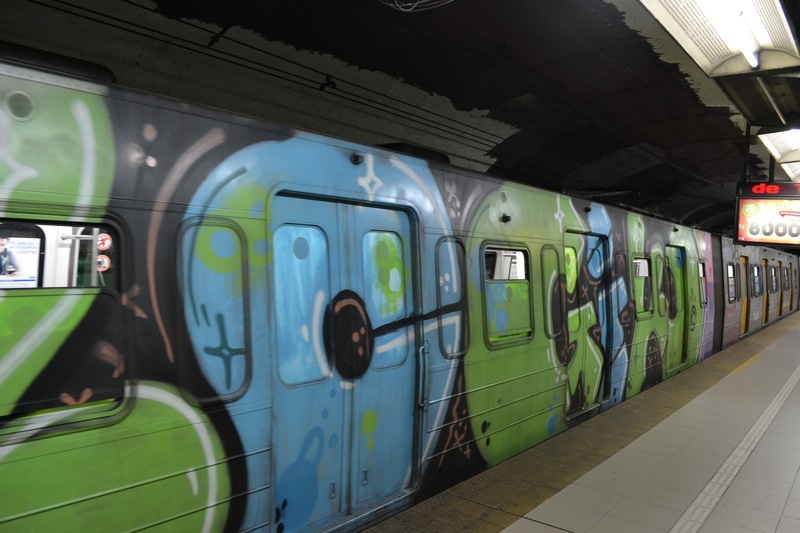 Today after breakfast we set off by subway to do 2 walking tours. 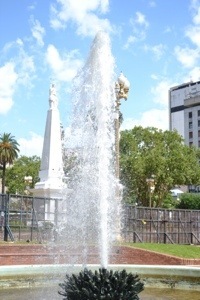 We started at the statue above, San Martin, the liberator of Argentina. Nearby were impressive mansions from an earlier time. 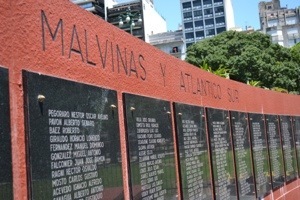 Next was the monument to the war over the Malvinas. You don’t call them the Falklands or mention the British around here. The monument reminded me of the Vietnam Veteran’s Memorial, with the names of the fallen etched in stone. 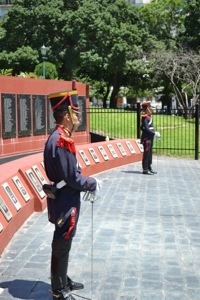 Two soldiers stood guard. 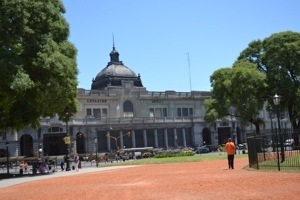 We stopped in the Retiro train station for a snack. Next, we walked along the Florida pedestrian mall, which allowed us to combine shopping with a walking tour. I got a leather wallet (Sorry, Coach. you are being retired for something nicer and cheaper). 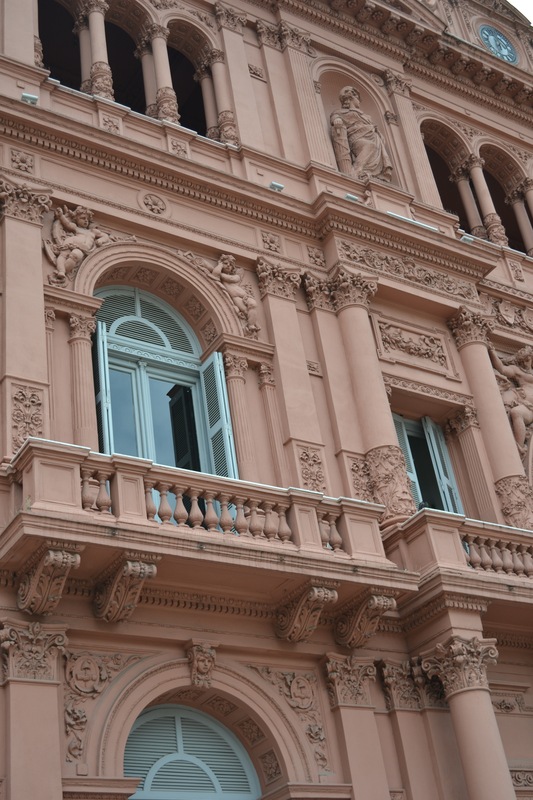 There are stunning buildings in Buenos Aires, many of them in shockingly poor condition. The tour included entry into a Burger King, to see the most stunning inside of a fast food place you will ever come across. The walking tour ended at a stop on our subway line, so we took the train back and walked through our neighborhood. We stopped for a cerveza (Sprite Zero for the wife) and some baked goods. We are off to an early dinner tonight, and then are being picked up for a tango show at 9pm, the celebration culmination of our 27th anniversary celebration. I’ll leave this post with a picture from our neighborhood. Beautiful graffiti art with a pile of trash in front. 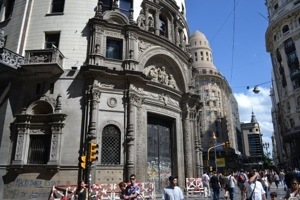 That’s the juxtaposition of Buenos Aires, a city we are growing to like more and more as we experience more of it. This was an “Ellen Day,” we left the hotel at 9:30am and got back just before 11pm. Some might say the big news was that we got SIM cards and got them working. I realize many might not. So I will quickly summarize what it took to reach this blissful state. It did not take all that long and only cost us $10 each for the chips and the credit. You can stop cheering now. We had fun along the way, from Serge the bald guy, who cut our chips to the nice guy at the Internet store who used Google Translate to talk with me and try to help out. Today was mostly about Eva Peron. We first took the subway to visit her museum. It chronicled her life, and included report cards, dresses and hats, and a death mask. For someone who only lived to 33, she made quite the impact. 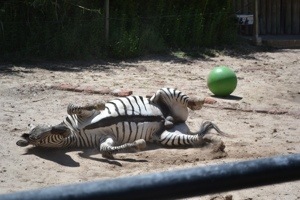 I think I liked the zebra who rolled on its back like Colby does. Next stop was the Retiro Cemetery . It is the wildest cemetery you will ever see. 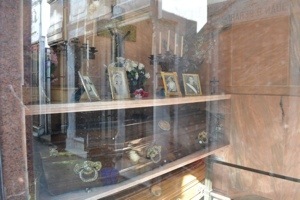 The crypts and mausoleums feature pictures of the dead, and you can see the caskets. 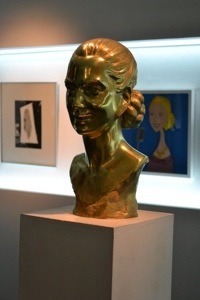 Of course you have to visit Evita. 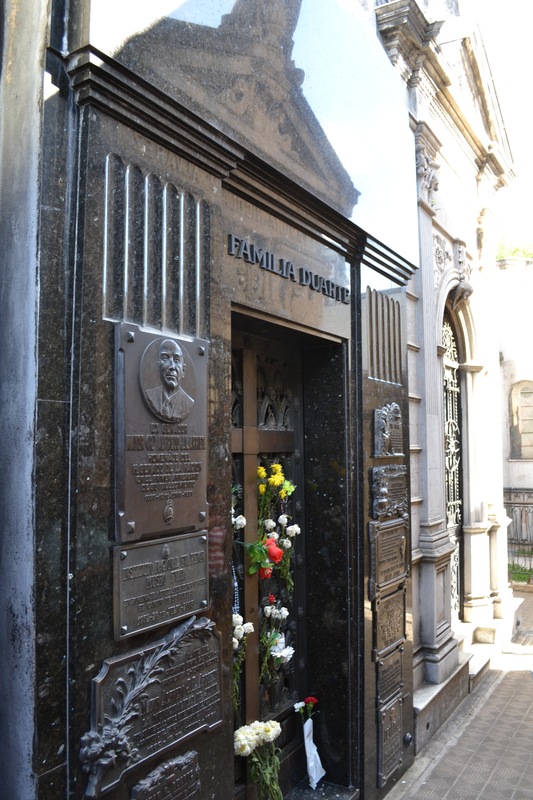 You’d think she would be easy to find, but given the history of her body’s travels, I guess it is a surprise she is in Buenos Aires at all. We made a quick stop at a mall across the street from the cemetery. We then walked to Hotel Sofitel, where my mother arrived yesterday for a departure tomorrow on a cruise. This happy coincidence allowed us to meet her for dinner for an early anniversary celebration we went to the The New Brighton and had a delicious dinner and great conversation. It was nice to meet up so far from home. Tomorrow is a day trip to Uruguay. Something a little different and a new country to visit. Today was a low-key day for us. We even sleep in until a little after 9. 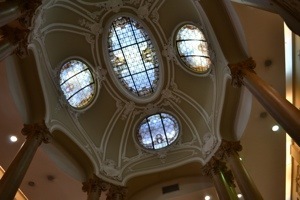 We had breakfast at the hotel, and then went off to explore. We took the subway to the Pueyrredon stop on the D line. We then proceeded to walk through town, looking at buildings and shop windows. More was open than we expected—many restaurants, a few shops and the ice cream places. We had lunch at Pertutti on Avenida Corrientes. We shared an empanada, which was in more of a puff pastry shell than the fried ones we are used to. We also shared a calzone. 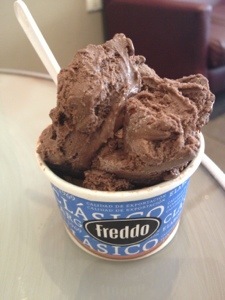 We had heard much about Freddo ice cream, and finally got our chance to try it. We’ve been having chocolate with almonds everywhere we go. This might have been the best. We came back to the hotel and had a drink outside. After a short stop in the room, we went to dinner. 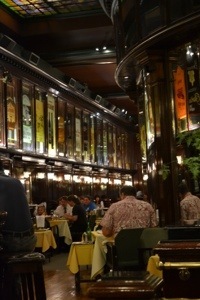 We went for steak again, this time in the neighboring Palermo Soho. 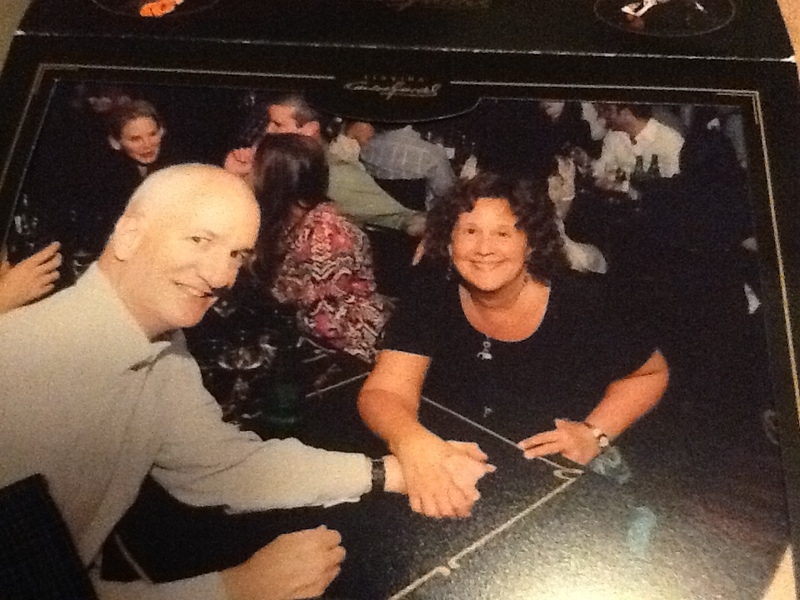 The restaurant was La Cabrera. It is written up everywhere and very popular. We didn’t have a reservation, but only had to wait about 35 minutes for a table. We were seated outside, on a comfortable night. The service was lacking however, we didn’t see our waiter for more than 1/2 an hour, and only after having approached the host. We didn’t have our drinks until almost an hour after being seated. That’s bad, anywhere. The food made up for the wait. 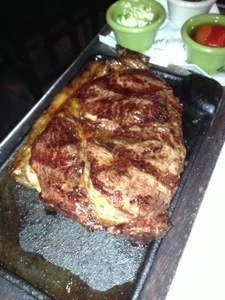 Ellen had a 200gm steak, I had a huge sirloin. The steaks alone would be something, but they came with a whole array of sides and sauces and toppings and other things we did not even recognize. It was an impressive sight, overwhelming and delicious. Ellen wrote a TripAdvisor review while still at the table. 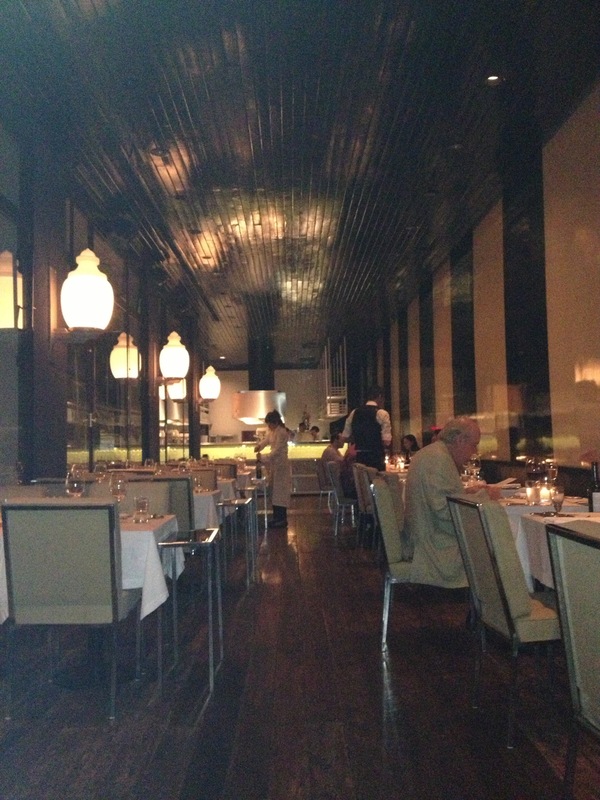 With all the steak available in Buenos Aires, why subject yourself to upsetting service. There were never apologies or acknowledgement that they were trying. 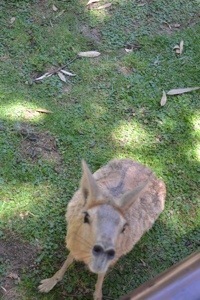 It just came off as indifference to our experience. We walked back to the hotel, and are ready to hit the Evita sights tomorrow. My mother arrived today for the start of a trip that includes a cruise to Rio. We are meeting her for dinner tomorrow night. Our hotel had nicely informed us that not much was open Christmas Eve. But a nearby 45 seat almost secret restaurant, Tegui, was. So we made reservations. Dinner was at 9. It was still 90 degrees, no relief from the heat. We walked the two blocks to the restaurant. 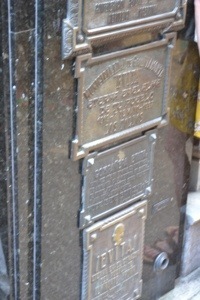 A solid metal door with the number and name marks the spot. It seemed almost like a Chicago speakeasy, knocking on the door to be let in. 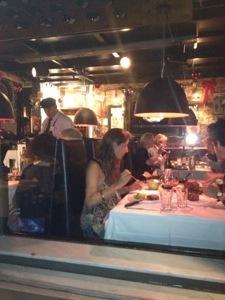 We had to go through black curtains to the dining room. There was a set meal of 5 courses. There was of course wine. We chose a Malbec, as did most of the other diners. Bottles were communal, they’d fill out glasses and then the bottle for someone else. It was unlimited, so it didn’t matter. It was a special meal. The kind of food that you might not be sure of all the ingredients, but you eat it anyway and it’s delicious. I asked to skip the oysters course, but instead they gave me buffalo mozzarella with salted strawberries on top. Who does that? It was yummy!. 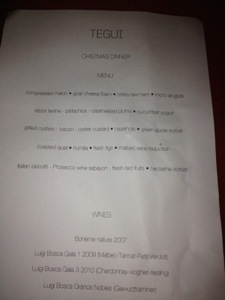 There was quite a long time between our third course and the main course. 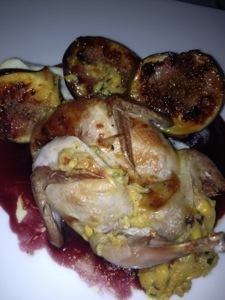 We probably could have benefitted from a short nap, but we waited it out, and the quail main course with figs was worth the wait. Dessert came a little before midnight. Then prosecco came to toast Christmas. They played Feliz Navidad, glasses clinked, and we finished off a delightful 3 hour meal. On the walk back to the hotel, fireworks were going off in the street and from rooftops. At a nearby restaurant, patrons were dancing in the street. 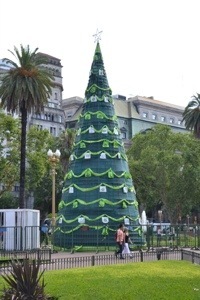 We got to experience a Buenos Aires Christmas that we will not soon forget. Today was for heading to the main plaza and doing a walking tour. Even if it was close to 90 degrees. First off though was breakfast at the hotel. 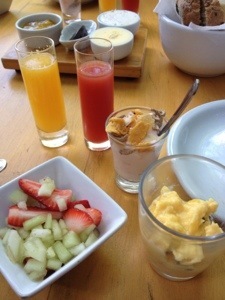 The presentation of the juices, scrambled eggs and yogurt was nothing short of beautiful. Although cabs seem popular here, we like to get to know a city via its public transportation. We walked about 10 minutes to the subway. A 10 trip ticket was 25 pesos, the equivalent of $5. Do the math, people. That’s 50 cents per subway ride. We took the D line to the Plazo de Mayo. 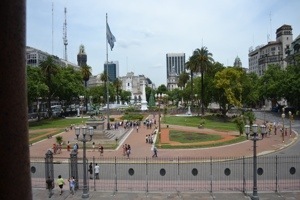 Described as the political center of the country, it is full of green space, fountains, and protestors. Perhaps the precursor to the occupy movement, you have Malvinas war veterans protesting no combat pay, the madres also protest the dirty war here. There was a Christmas tree in the plaza. 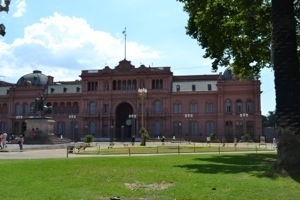 The Casa Rosada is the focal point of the plaza. 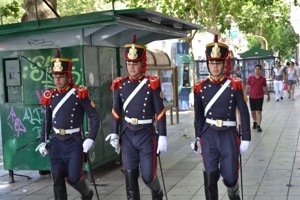 We happened to see guards walking down the street. They must have been so hot! 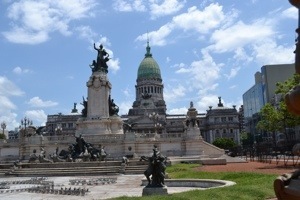 We walked up the Avenue de Mayo, past once fancy hotels, interesting architecture, and finally the Congress building. It was plenty hot, but mostly interesting. On the way to catching the subway home, we passed an open Movistar store. We found out that the iPhone is still uncommon here, so they don’t readily have the right size SIM card. It’s looking less likely that we will get one on this trip. But as my Instagram and Foursquare followers have likely found, there is quite a lot of free WiFi at restaurants. And a little disconnection never hurt anyone. Meals today consisted of a few stops for snacks that made up lunch. Plus, a stop for ice cream when we were back in our neighborhood. We found out that where pies might be popular for Christmas dessert back home, ice cream serves that place down here. There was a long line as most people seemed to be getting multiple kilos of ice cream. A woman in line chatted with me, apologizing for the unusual heat. She must have quoted a funny humiture index, as she claimed the “skin temperature” was 50 degrees Celsius (122F). Not only did she apologize for the heat, but for the trash in the streets. She said that was a new phenomenon, related to a corrupt mayor. The things you learn while waiting for ice cream. We have a fancy dinner planned for tonight. I’ll update tonight when we get back. 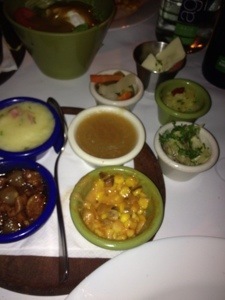 Dinner is at a traditional Argentinian time, 9pm.